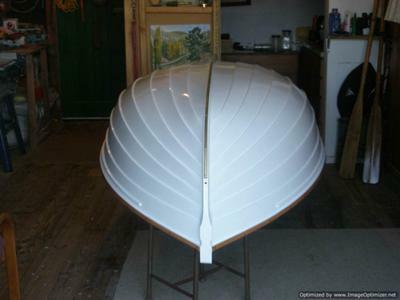 I thought you would like to see some pic's of my 8ft Classic ‘Squadron’ Clinker Dinghy that I have just recently completed. 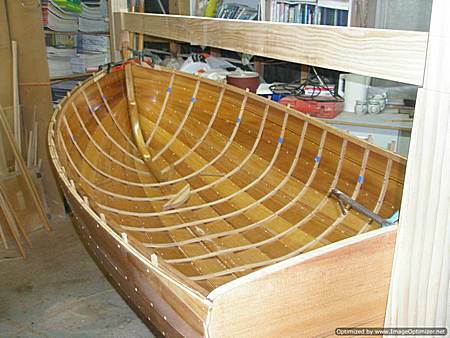 I have had numerous traditional and modern boats over the years that I have worked on but until now hadn’t built one. The plan has 8ft ‘Squadron’ Dinghy as the design. I presume that this was a common design in New Zealand, which was adapted to suit the size of boat that was to be built. I was given the plan by a retired boat-builder who also gave me advice on the build. 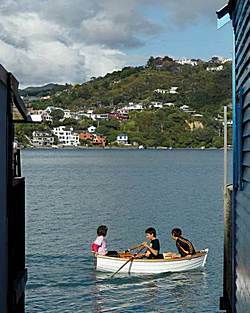 The dinghy is also the perfect fit for my boat-shed which is located on the Pauatahanui Inlet, which is part of the Porirua Harbour. Lying 30K north of Wellington, New Zealand, Porirua Harbour, is an area of shallow, sheltered water ideal for small yachts and board sailing. And Pauatahanui Inlet is the most extensive area of relatively unmodified estuarine water in the southern part of the North Island. I stared the build in July 2010 and launched her in May 2011. She could have been built a lot faster but I was enjoying the building process and didn’t really want to finish it too soon. She is planked in Island Kauri and the timbers are White Oak with Teak used in the rowlock blocks and cleats. Kauri New Zealand’s most famous native tree is one of the largest trees in the world, growing up to 50 metres tall. The Maori have used Kauri timber and its gum for building canoes for thousands of years. Early European settlers soon found the trunks of young kauri were ideal for ships' masts and spars and that the sawn timber from mature trees was of unsurpassed quality for boat building. She has been copper roved and then finished off with eight coats of paint and varnish. As you can see she rows really nicely and is stable in the water. 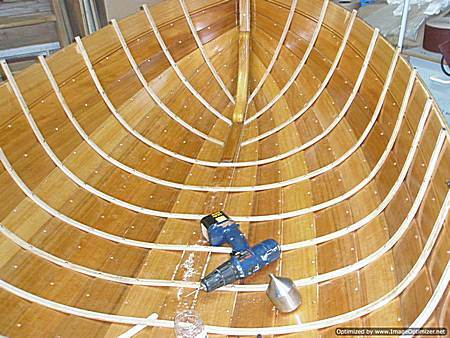 I enjoyed her building so much that I have just finished the stem and keel on another dinghy of the same design. I have add pictures below that hopefully will give a good idea on how the build progressed. 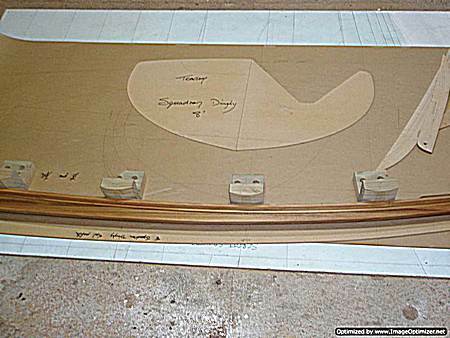 The full size templates for the moulds were taken direct from the plan also the templates for the keel, stem, garboard, sheer strake and transom. Here are a couple of pics of the stem and keel that I’m working on at the moment. These are laid up on the plan and clamped and glued into shape using blocks that are screwed down onto the plan to get the correct shape. The stem is made in three pieces and epoxy glued together using resin and glue powder mix. The stem was then marked and the rabbet is chiselled out. 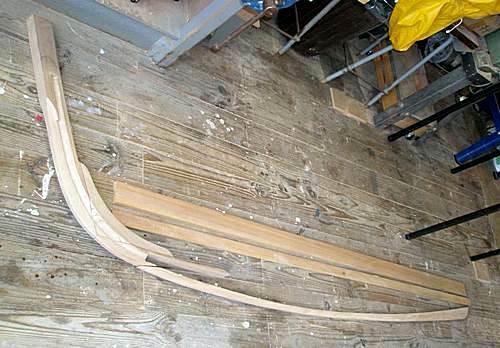 The keel was also made in three pieces and shaped to fit into the stem. All the planks were steamed to shape fitted into place so they would take shape. The following day they were removed sanded and the bevel line marked. They were then coated with two pot Altex Epoxy Timber Sealer before being refitted and copper roved. Were the plank fits into the stem rabbet it was epoxy glued and a couple of temporary screws are fitted to hold it in place, these are removed the next day before it cures. The garboard plank is copper roved up threw the hog and epoxy glued only at the stem and on to the transom. 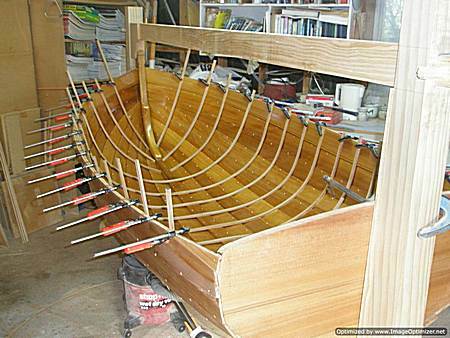 The ribs were also steamed and fitted into place to take shape before being copper roved the following day. Before painting she was removed from the jig, turned over and the copper nail heads that are counter sunk were plugged with epoxy which was faired off before painting. On the outside of the hull there are two coats of primer and eight finish coats of single pot "Altex" marine paint. The interior and transom has also had eight to nine coats of single pot "Altex" varnish, I have used single pot paint and varnish so it will be easier to remove in the future than the two pot mix. You did a great job building the Squadron. It makes me want to build one. Can you tell me where I can get a set of plans. Many people are asking after the plans- myself included. I can’t find them on the net; where can I buy them from please? Well done. 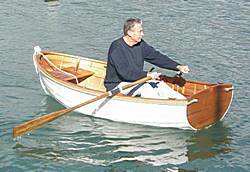 I am looking to purchase an 8 ft genuine clinker dinghy for display. Is yours for sale ? Are you aware of a similar boat for sale? What a stunning boat - have been looking for a design with more freeboard after taking an 11ft open carvel clinker dinghy over 2,000 km down the Murray River in Australia - pretty hairy at times with very limited freeboard. Where can we get the plans please? What a beautiful,seaworthy dingy of which you can be very proud; I wish you many years of sailing enjoyment. Me ha gustado mucho tu trabajo y el diseño del barco. 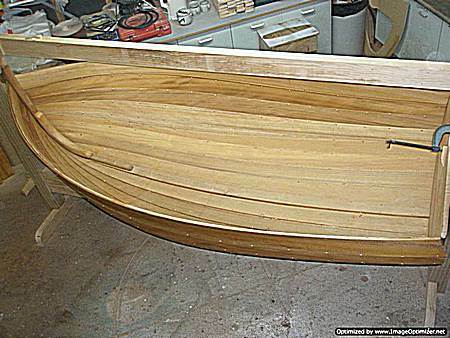 Soy un viejo constructor de barcos de Barcelona, que ando buscando unos planos y especificaciones para construir un dinghy de características y tamaño parecidos. Me puedes indicar como puedo obtenerlas. lovely boat amazing job . can i buy a plan ? My dream to build one myself! Please please let me know where can I can get a copy of the plan. Have been looking to build one very similar. Wondering if you could give me a lead on a set of plans. Would be my first build. Thanks for any help, Jim. My brother and I had a Squadron Sailing Dinghy in the late 1940s till we grew out of her in the early 1950s and graduated to a Zeddie. We have no photos of Polly Puddle Duck, which is a great shame, because she was beautiful. My memories of her hull are exactly like your masterpiece, except for her centerboard case. She was designed and built, by A W (Bill) Couldrey as were about a dozen of them. They were gunter rigged and all the spars fitted inside the hull, so she was an ideal tender. I'd love to have plans. my 3 sons and I need a fishing sailing dinghy. Beautiful boat, great construction story. I am inspired to have a go. How do I go about getting the plans ? I would love to get the plans for this beautiful boat. I am associated with the Oxenford Men's Shed Qld. We have a donation of old school benches. They are Kauri Pine. I would like to build an 8ft dingy out of them. Any way to get the plans for this clinker dinghy? Would like to build one. 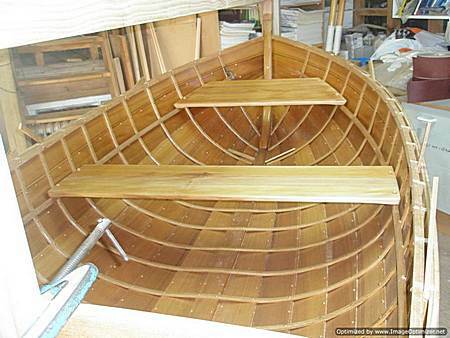 Hi I just love this dingy and would love to buy a set of plans so that I can build one in Huon Pine here in Tasmania. 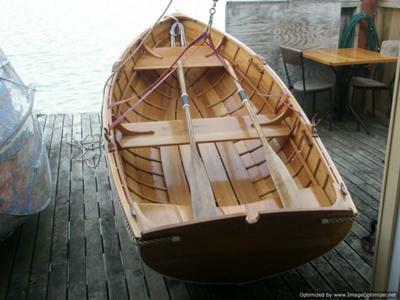 I have just bought an old 1955 30 footer and need a dingy to compliment my new sloop. I am happy to pay extra for full size patterns if you can trace them on paper. I can also loft the patterns if needed. Is there anyway to get the plans for this boat? Its awesome. 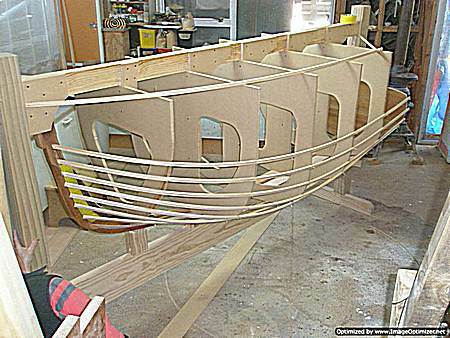 I just finished building an Oughtred Caledonia Yawl - clinker built but uses epoxy instead of copper roved nails, which I have also worked with. 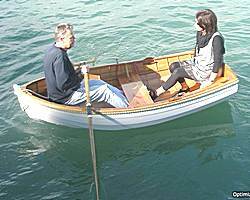 I am looking for a good small stable dinghy design to build next. This looks very much like what I am looking to build. Is it still possible to get some more information on this boat like offsets or plans? What is the beam and beam water line, length water line, etc? And having used this boat now, how is she in handling 3 folks under 200#, initial stability, etc.? I appreciate any help you can lend. Great job can you email me the plans? Hi I have finished an 8' 4" clinker. 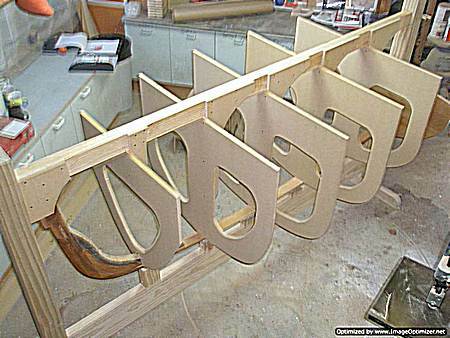 I have all the moulds clamps, bed table if any one would like to build one. The mould spacings can be altered to vary the length. Please send me a copy as well! dreamr DOT okelly AT gmail. You did an AMAZING job with that tender build! I would like to build this of you could email me a set of plans that would be great! Hi, most impressed with your boat. Well done with your dinghy. 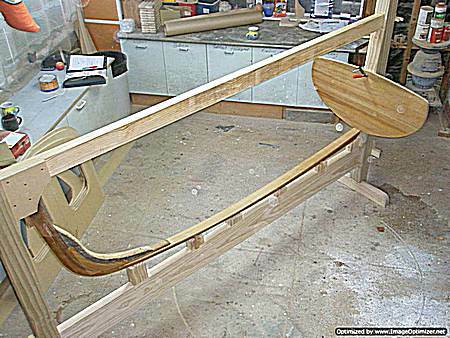 I built recently a 3 meter clinker in Ngaio Wellington with marine ply and copper roved to Tanekaha steamed ribs. Looks very similar to yours. I move to a Seaview Rd Paremata home early January, so perhaps we can meet up and do a mutual admiration club meet soon. I think you know Ross Giblin photographer and new neighbor of mine who told me of your new boat some time back. If you wish to make contact Ph Vic 0274 476 329 or 4797 539 till 17 January. Would love to build a 12ft dinghy same lines as the 8ft squadron. Hello,yes I have looked on Ian's site. The only one he has is the 'Auk' which is 7ft 10" if I remember right. This looks a nice little traditional tender, but I think the "Squadron" dinghy looks nicer from what I can see from the photos, didn't know whether this is a dinghy native to New Zealand. Have you looked at Iain Oughtred’s Designs? by: Steve in the U.K.
Lovely build, really nice job done. You?ve made an absolutely superb job of her. 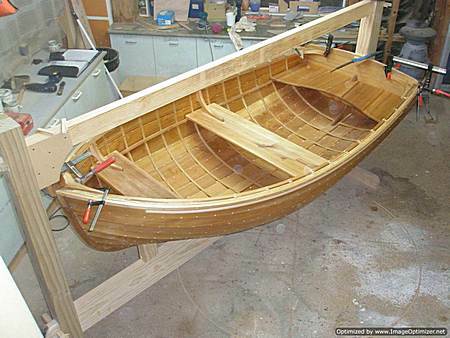 It?s good to see the traditional boatbuilding methods being kept alive, there is just something extra special about a proper wooden boat that can never be replicated in ?plastic?. I hope you are you planning to take her to Lake Rotoiti in March for the Antique & Classic Boat Show, she deserves to be shown.